In their last 3 football games against Division I competition, Wagner scored a grand total of 34 points in three losses. Tonight on a cold, windy evening in Staten Island, the Seahawk offense came to life against Lehigh. The Seahawks scored on their first offensive drives of the first half and second half on big plays, a 50 yard run by RB Ryan Fulse and a 30 yard pass from QB Ryan Massei to WR William Dale. Fulse would add a touchdown and RB Denzel Knight would add touchdown runs of 24 and 60 yards to put up five touchdowns on the Mountain Hawk defense. Unlike prior weeks, Lehigh maintained a lead against Wagner during stretches of the first half. Junior RB Dominick Bragalone got a 26 yard run to give Lehigh and early lead, and junior QB Brad Mayes would take it in on a read option to go up 14-7. But then the Seahawks would go on a 30-6 run after that aided by five Mayes interceptions. "We're tired of talking every week about winning a game," a downcast Andy Coen said afterwards. "We have to go out and do it." After Lehigh jumped to a 14-7 lead, Wagner went on a 12 play, 95 yard drive to tie the game with the longest play being a 12 yard run by Fulse. But after Fulse's surge through the line tied the game, a short, wind-blown kickoff landed in between a bunch of Lehigh defenders, and Wagner LB Allaah Sessions alertly fell on the ball. It led to a 26 yard field goal by PK James Cooper, and Lehigh never fully recovered, especially after Wagner would receive the second-half kickoff and and drive the length of the field, leading to Dale's touchdown. WR Gatlin Casey was held without a reception for the first time in a long time, but he drew several penalties before going out with a lower body injury at halftime. And freshman WR Jorge Portorreal filled in very well, getting his first 100 yard receiving day with 8 catches for 132 yards. Senior WR Troy Pelletier also had a good statistical day with 6 catches for 143 yards. And the defense played better in spots, led by the inspired play of senior SS Quentin Jones, who had 8 tackles, 7 unassisted with 5 pass break-ups, each one seemingly stopping Wagner drives in their tracks. 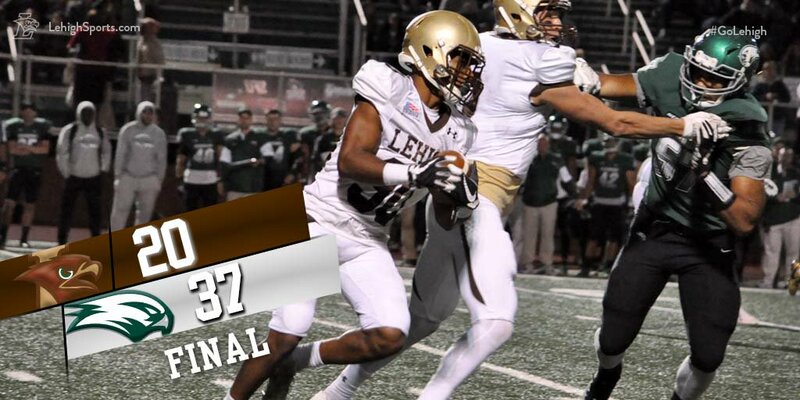 But Mayes, who was evading pressure all evening, was sacked 4 times and went 18 for 45 passing, was picked five times, the first time Lehigh had that many interceptions in a game since 2014. And the defense still game up big plays in key spots, including two touchdown runs of 60 and 50 yards that accounted for 110 of Wagner's 249 yards rushing. "We came close to getting back in the game, but it was just a bad day," Andy continued. "We've had a lot of bad days and we need to figure out how to get rid of those bad days." Conference play begins next week, and there is no more room for bad days. And....the Defensive Coordinator still has a job...WHY is this exactly? The worst defense in FCS..and the Defensive Coordinator, a guy from Franklin and Marshall named Craig Sutyak (?) still has job? Can someone please explain...Chuck? Anyone? Chuck, please do not pick Lehigh this week, please, we are begging you. Just drinks, max out on the Drink of the Week analysis, and forget about winning the battle of the trenches. LU will never win that in 2017. Do not analyse, do not discuss this factor. It is not possible for LU to win the battle of any trenches, unless the NCAA allows in season transfers. LU is weak in 2017, and its a sad fact. I used to work on Staten Island before moving to NJ lol .hearing the commercials about Van Duzer street and Forrest Ave brought back memories and years when Lehigh had some great teams. No team in the PL has a winning record. Schools offer full rides, and this is what you get? Ivy League (non scholarship) versus PL this year 7-1. Colgate could actually win the PL, and they are pathetic. Two wins this season against two teams who are winless. LU was supposed to win PL. Weakest league in FCS. How do these guys keep jobs? The Patriot League champ this year should NOT have an auto bid, but in most years it is well deserved. Very strange stuff in 2017. Yesterday, Tom Gilmore's Holy Cross team loses to a terrible Lafayette team, just a couple weeks after destroying New Hampshire, a perennial top 10 national FCS program. Nothing makes any sense, so it is entirely possible that our Mountain Hawks could run the table in the PL this year and end up in the FCS playoffs, even with the 121st ranked defense in the land. How in the world HC lost to the Pards.....I will have to research that one...one big mystery. Colgate is the hands down favorite at this point. Andy is a dead man walking. Team was totally unprepared to compete this season and he's lost the locker room. Total house cleaning is coming. It is pretty bad when, after giving up 37 points to a nothing team, the coaching staff terms the defensive effort " ... for the most part, a bunch of improvement". It seems that the M.O. of the past few years - which is obviously not working - has been to put all emphasis on offense and simply hope to outscore the opponent. With the relatively recent advent of athletic scholarships, I hoped we might move up from a high teen rated team - dependent on the Patriot League automatic bid to make the playoffs - into a seven to twelve rated program advancing of its own volition. Instead, we are headed back to Division II. Lehigh has been completely outplayed and overpowered by every team it has played so far. The opponents all seem to have more intensity and more athletic ability. The defense is not competitive, the kicking and punting is horrible, and the offensive line can't run block or pass block. The few high caliber offensive skill players are the lone bright spot. How is it that scholarships have not improved player quality, and why does Lehigh rarely have a good defensive team? Recruitment seems to be a bigger problem than coaching, but I am not sure.